← We lost another good man. 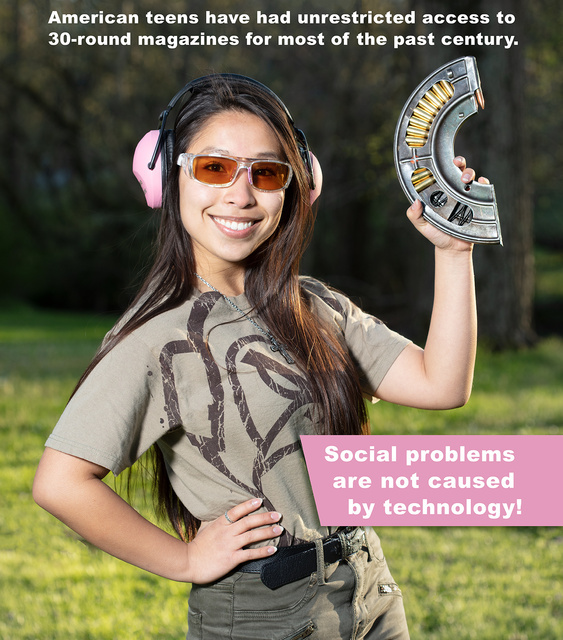 Until 1994, any teen in America could buy a 30-round magazine, in person or by mail. From 1957 to 1968, they could buy an AR15 to go with it, mail order if they so wished. After 1968, they would have to be at least 18 and buy it in person…still, plenty of teens and young adults had them with few problems. Sure, mass shootings could happen…with 3-shot hunting rifles wielded by much older people, who in turn were suppressed by lawful college students with personal rifles. Once “gun free zones” guaranteed disarmed prey to psychopaths, and mass media guaranteed fame, the incentives for attacking vulnerable segments of the population were in place. The results have been as predictable as they are unnecessary. Compare the experience of home schools, where the mentors and a high percentage of the students are armed…yet no mass shootings occur. Factors other than access to hundred year old technology are at work here. This entry was posted in ammunition, rifle, rkba, self-defense, weapon and tagged 7.5mm, Chautchaur, girl, machine gun, Pro Ears, teen. Bookmark the permalink. 6 Responses to Technology isn’t the devil. Appreciate your sense of humor. Humor? I see the dissemination of facts, very well-stated, but I can find no attempts at humor. And the UT tower incident, while it may have been the first mass shooting on a college campus, was not the first college mass murder. In fact it wasn’t the first one that summer. The Chauchat mag is humorous. Good choice for an example of a scary looking mag. The young lady is lovely. Nitpick: First commercial-civilian AR-15 pattern (not AR-10) rifle was, as far as I can tell, the Colt SP1, first delivered to customers in 1964. In 1957 it wasn’t even a prototype.